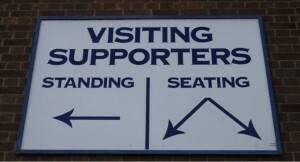 When I wrote Stand Up Sit Down, examining the history and arguments for and against permitting standing at football matches, it was clear that overwhelming evidence backed supporters being allowed the choice to either sit or stand as they watch their teams. It was also clear, that whilst their arguments were weak, there was a reluctance in the various authorities to change the status quo. Hillsborough was often quoted, but review and inquests have now found as I concluded, that the disaster was not caused by fans or by terraces, but by a failure to plan and manage the crowd. One by one the other arguments have been won, to a point that the media now struggle to find anyone to put the case against standing. 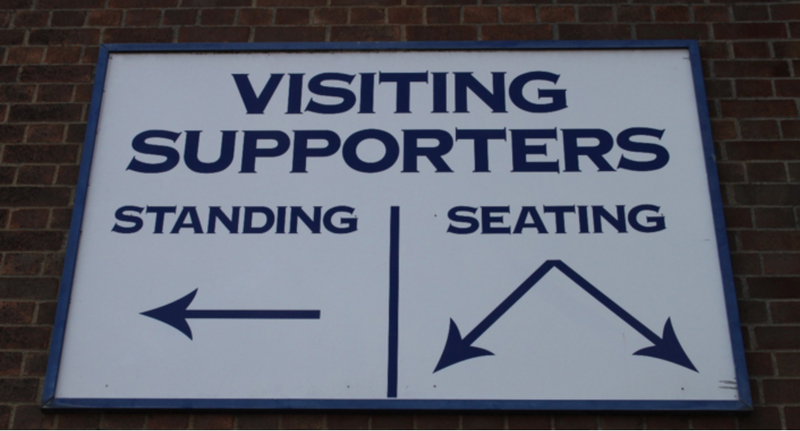 The term ‘safe standing’ is now commonly used but it’s easy to forget that there are still 19 clubs in the Championship, League One & League Two where each week fans stand safely on traditional terraces. 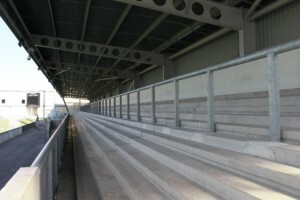 Some like Burton & Morecambe (below) are modern terraces in new grounds, others such as Carlisle and Exeter are older stands but with modifications made to meet current safety standards. All are safe but whilst the ideal for many fans, they are not the answer everywhere. UEFA regulations require all seated stadia for European matches (although of course thousands still stand in front of their seats), so those clubs with realistic ambitions to play in Europe need another solution. Convertible ‘rail seats’, with a seat that can be locked down for ‘all seater’ matches and up for other games, are commonly used in Germany. 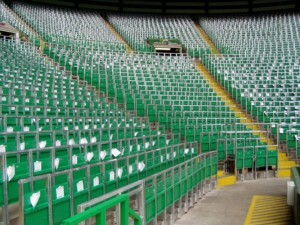 They meet UEFA regulations and with each row having a rail in front it’s hard to make any reasonable argument that they are not safe. Indeed they are safer than the widespread standing in front of seats that we see at every Premier League match. If we are to see a reintroduction of standing areas in the top leagues it will be with rail seating. 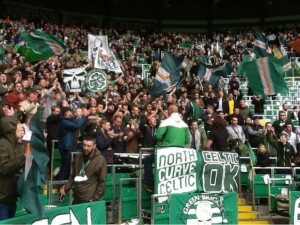 Celtic have lead the way. 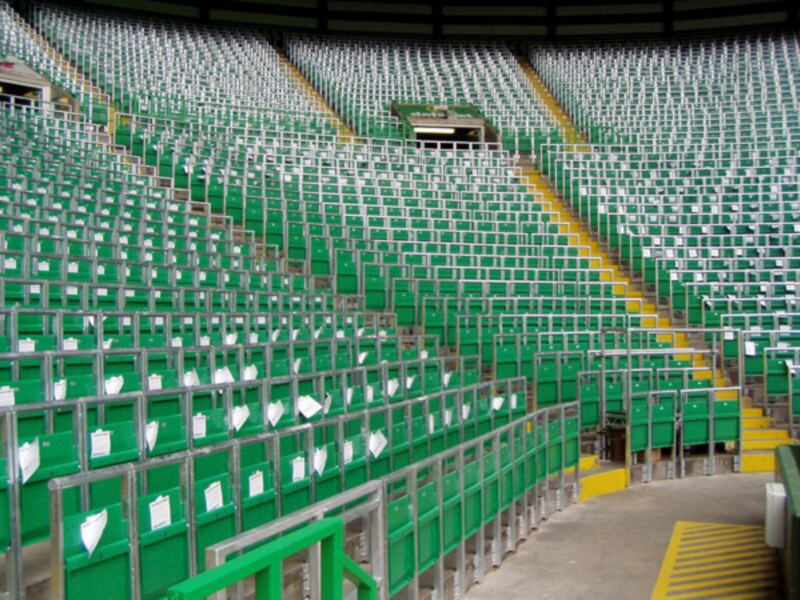 The Football Spectators Act does not apply in Scotland and last year 3,000 rail seats were installed at Parkhead. 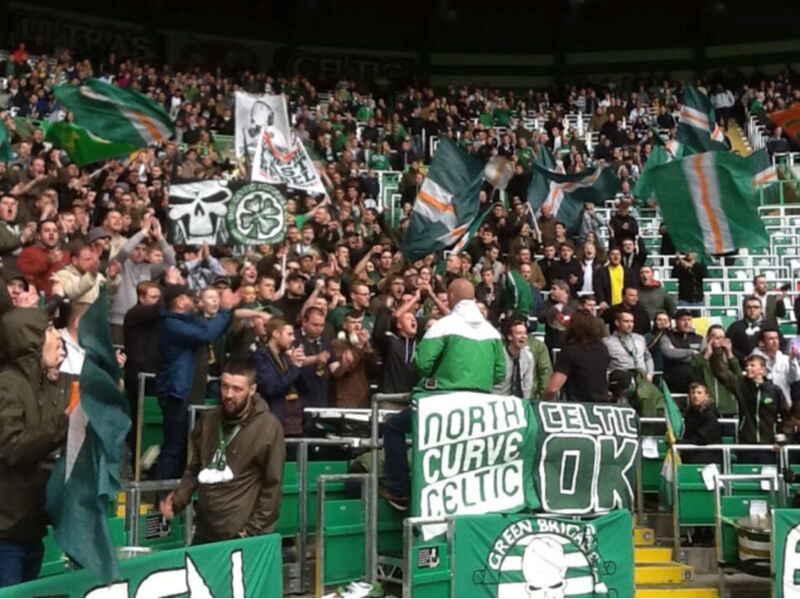 They’ve been a huge success – much sought after by fans of all ages, producing a tremendous atmosphere and with no safety related incidents. The Local Authority and Stadium Safety Officer are very happy with them. The next stage is a trial in England or Wales but options are limited as current regulations forbid clubs who since the 1990s have played for more than three years in the top two divisions, from having any standing areas. 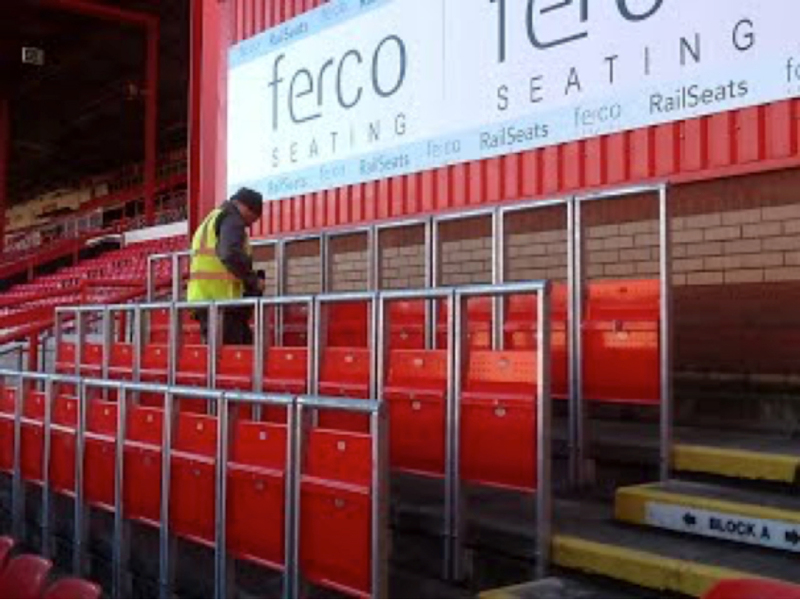 On a very wet day in February 2014 I attended the unveiling of a small block of rail seats at Bristol City, but regulations permitted their use only for rugby matches. Rugby fans can stand but the football fans have to sit. We have now reached the next important stage. Shrewsbury Town don’t fall under the all seater ruling and have agreed to take out an area of seats and convert them to safe standing. The benefits however will go far beyond Shrewsbury fans. A successful trial at the New Meadow could open the way to standing areas being introduced around the country. We know many clubs who want to install standing but first the government has to relax the all seater regulations. If enough money can be raised for a successful trial at Shrewsbury it will be a big step towards persuading the government. Fans across the country are contributing to raise £75,000 by crowdfunding. 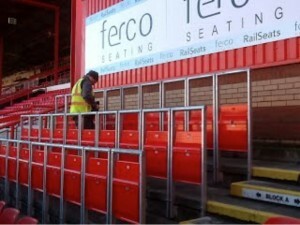 https://www.tifosy.com/en/campaigns/support-the-campaign-to-install-england-s-first-safe-standing-area. The mood is changing in favour of the choice to stand and all contributions will help achieve the first trial in England and move the campaign forward. Please consider making a donation – it might be your club who is next to offer the choice to stand.